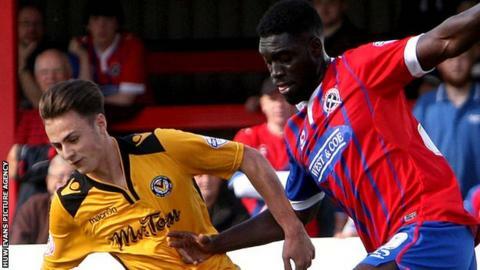 Newport County are still without a win this season following a goalless draw at Dagenham & Redbridge. Newport striker Lenell John-Lewis had the best chance of the first half but shot wide from an acute angle. Veteran Dagenham & Redbridge forward Jamie Cureton had an injury-time shot tipped over the bar by Joe Day. The draw sees Newport stay at the foot of League Two with just two points from eight games, while the Daggers drop to second bottom. "With the chances we created, certainly in the second half, we're disappointed to have not scored a goal. "There were words said at half-time, there was no real urgency in the first half. "We just played at too slow a tempo and didn't really warrant anything out of the first half." "It felt good to get the clean sheet and good to come away and get an away point. We played far better last week and lost so we know we can play better. "Joe Day made some good saves and they missed some opportunities. We had some reasonable chances in the first half and still looked a threat when we went forward in the second half as the game become stretched. "It is a good point for us. We put in a gritty performance to grind out a point and that feels good." Match ends, Dagenham and Redbridge 0, Newport County 0. Second Half ends, Dagenham and Redbridge 0, Newport County 0. Corner, Dagenham and Redbridge. Conceded by Joe Day. Attempt saved. Jamie Cureton (Dagenham and Redbridge) header from the centre of the box is saved in the top centre of the goal. Attempt missed. Matt Partridge (Newport County) header from the right side of the six yard box is close, but misses to the right following a corner. Substitution, Newport County. Lewis Bamford replaces Medy Elito. Corner, Newport County. Conceded by Andre Boucaud. Attempt saved. Seth Nana Ofori-Twumasi (Newport County) right footed shot from outside the box is saved in the centre of the goal. Attempt saved. Scott Barrow (Newport County) left footed shot from outside the box is saved in the top left corner. Corner, Newport County. Conceded by Nyron Nosworthy. Attempt blocked. Josh Laurent (Newport County) right footed shot from outside the box is blocked. Aaron Collins (Newport County) wins a free kick on the right wing. Tom Owen-Evans (Newport County) wins a free kick in the defensive half. Josh Passley (Dagenham and Redbridge) wins a free kick in the defensive half. Foul by Tom Owen-Evans (Newport County). Attempt missed. Jamie Cureton (Dagenham and Redbridge) header from the centre of the box is close, but misses to the left. Attempt missed. Josh Laurent (Newport County) right footed shot from the left side of the box is high and wide to the right. Attempt missed. Matt McClure (Dagenham and Redbridge) left footed shot from outside the box is high and wide to the left. Attempt saved. Matt McClure (Dagenham and Redbridge) header from the centre of the box is saved in the centre of the goal. Attempt missed. Jamie Cureton (Dagenham and Redbridge) left footed shot from the right side of the box misses to the left. Substitution, Newport County. Josh Laurent replaces Zak Ansah because of an injury. Substitution, Dagenham and Redbridge. Jodi Jones replaces Zavon Hines. Attempt missed. Mark Byrne (Newport County) right footed shot from outside the box is too high from a direct free kick. Zak Ansah (Newport County) wins a free kick in the defensive half. Foul by Josh Passley (Dagenham and Redbridge). Attempt saved. Matt McClure (Dagenham and Redbridge) left footed shot from outside the box is saved in the bottom right corner. Scott Barrow (Newport County) wins a free kick in the attacking half. Kane Ferdinand (Dagenham and Redbridge) wins a free kick on the left wing. Attempt missed. Matt McClure (Dagenham and Redbridge) right footed shot from the centre of the box is too high. Corner, Dagenham and Redbridge. Conceded by Kieran Parselle.